Ford managed to pull off the Fiesta and Focus ST, two sporty and fun hot hatchbacks that this world needs more of. Then it brought an Edge ST to the Detroit Auto Show and we all let them get away with it. We shouldn’t have, because the company just confirmed the next generation Explorer will also get an ST trim. Is there nothing pure left in this world? Ford confirmed the upcoming next-gen Explorer ST at a press conference held to pitch its future earlier today, according to Motor Authority. 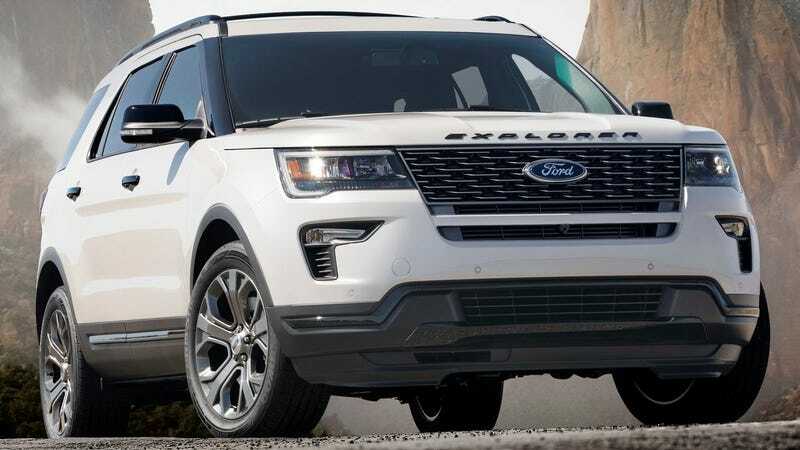 Back in January, we first heard rumblings and rumors of the Explorer ST from anonymous sourcing over at The Truth About Cars, which claimed the sporty SUV could benefit from a twin-turbo V6 and potentially even come in rear-wheel drive. I’ll admit that doesn’t sound terrible, but it’s a far cry from what Ford’s ST stood for not too long ago. Now it’s just an expensive trim level that sounds kind of fun. The confirmation of the next-gen Explorer ST came amid a wave of news from Ford, including a surprise smaller sibling to the upcoming Bronco and the new GT500. If you can’t make the necessary sacrifices for any of those exciting cars, I guess Ford has you covered with a giant sporty SUV. That’s nice of them.